Dedicated readers and fans of Theodor Seuss Geisel, or Dr. Seuss, know of Seuss’s fascinating, long-forgotten career as a political cartoonist for the New York daily newspaper PM during World War II. Dr. Seuss, however, was only one of a number of distinguished cartoonists whose work appeared in PM. In Dr. Seuss & Co. Go to War, we discover an astonishing treasure trove of over three hundred incisive political cartoons by Seuss as well as a cohort of other legendary cartoonists of the time, including Saul Steinberg, Al Hirschfeld, Arthur Szyk, Carl Rose, and Mischa Richter. These fascinating cartoons offer a totally different picture of the war, both at home and abroad. 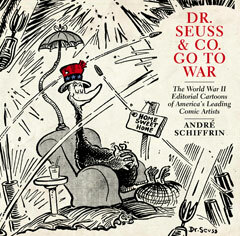 Sure to fascinate and surprise readers across the generations, Dr. Seuss & Co. Go to War lets readers “time travel to a remarkable time when editorial cartoons really mattered” (America in WWII).